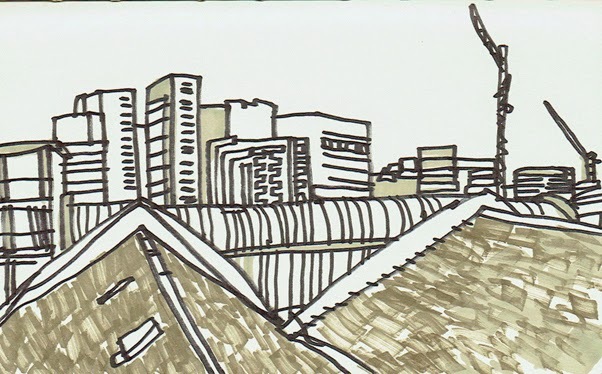 Last Sunday's sketchcrawl around Trinity Buoy Wharf in Docklands was an eye-opener for me. 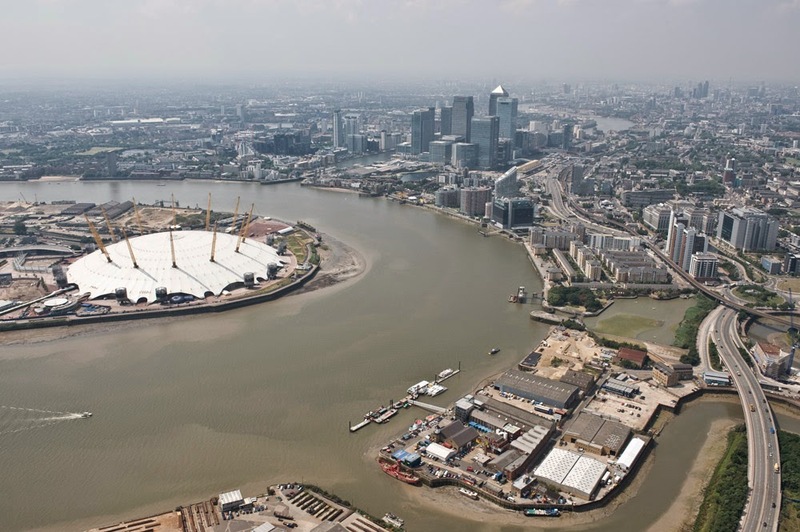 I'd never been there before – the wharf sits across the river from the O2 Arena and is stacked with history. 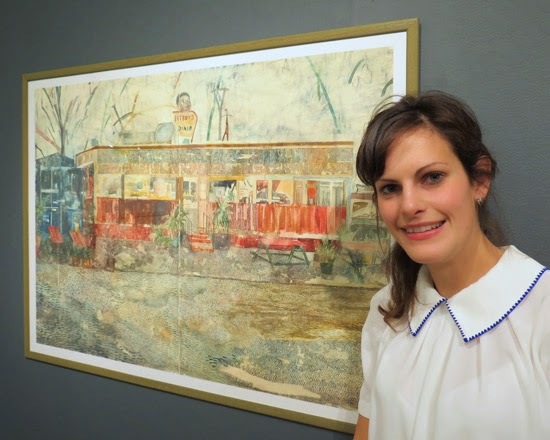 The event, with the Campaign for Drawing, the Dining Room Drawing Club and Independent Art School, merged heritage, water and new developments. It was great to meet new people and those I'd only known online before. This is one view from the top of the lighthouse. An exhibition of drawings by shortlisted artists in the John Ruskin Prize 2014 continues at the Electrician's Shop Gallery there until 30 November. Thanks to the Campaign for Drawing for asking us. Having chosen to take the scenic route, which meant my walk was twice as long, I was rewarded by a lovely misty view of the cable cars. Things are so much more magical when you can't see them properly. I'm glad I got this done before joining the rest of the Urban Sketchers and Campaign for Drawing-ers as I didn't pick my pencil up again for the rest of the day. Rain dampens my spirits. 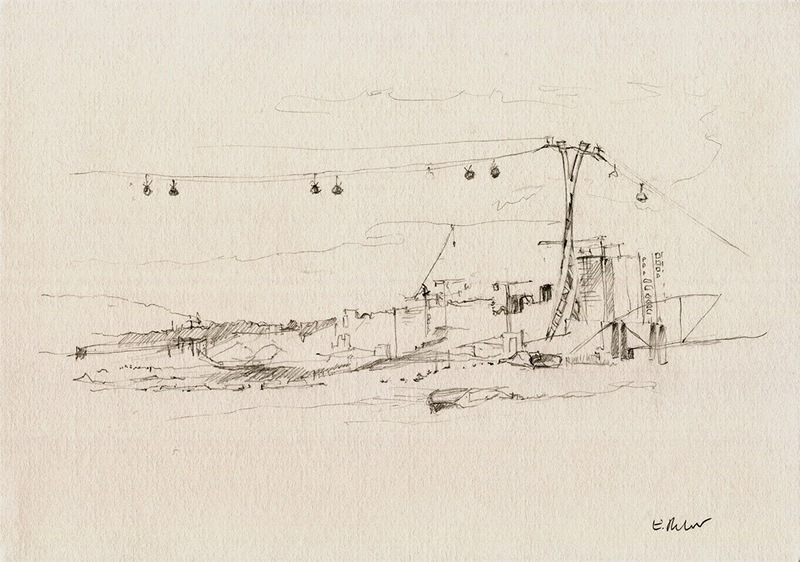 Urban Sketchers London is participating in Draw Britain Now - a big drawing event on Sunday 16th November 2014 at Trinity Buoy Wharf - between 12 and 4pm. The event has been organised in collaboration with The Campaign for Drawing, Trinity Buoy Wharf (Urban Space Management) and The Guild of St. George. Here are some things you can see and sketch at the Sketchcrawl on Sunday at Trinity Buoy Wharf in East London. A lighthouse -the only one in London! It was built in 1866 to be a place to test new forms of lighting for lighthouses. This is where the 19th-century physicist Michael Faraday conducted optical experiments. Container City - featured in numerous television programmes, brightly painted live/work spaces in stacked containers (More info). The stacked containers of Container City II have a ziggurat shape. Read Living in a box to understand more about the people who live here. Urban Space Holdings have created a mad little urban quarter totally unlike the high-finance citadels and luxury-living elsewhere in Docklands. A sense of time and tide, lapping at the beyond, permeates the place. Let’s hope it survives yuppification, sea-level rise and the collapse of civilisation, at least until the music stops. Sue Grayson Ford - the Director of The Campaign for Drawing - will be on site to open the Electrician's Shop Gallery from noon, so sketchers can collect there, see the exhibition of drawings, paintings and textiles focused on the urban (and occasionally rural) scene, use the loos and leave any heavy items. The Gallery will remain open until 5pm. 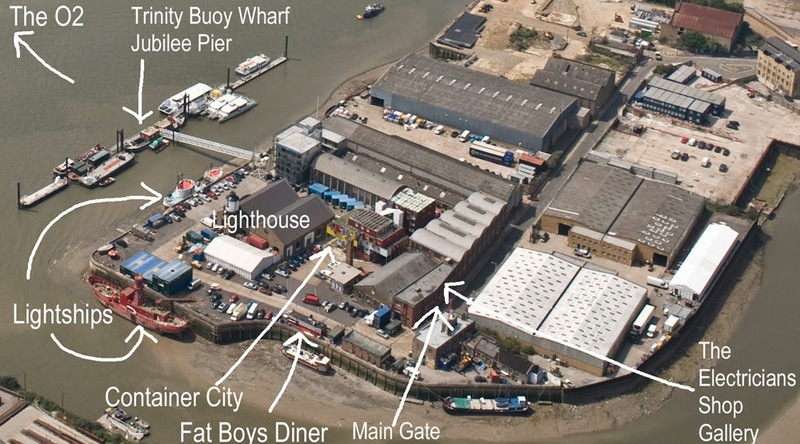 The website provides advice about how to get to Trinity Buoy Wharf. Just use the Edit button and change the "From" location to make it relevant to you. In 1515, Trinity House was granted a charter by King Henry VIII.Trinity Buoy Wharf was where Trinity House used to build and maintain the buoys and lightships which were used to aid navigation around the Kent, Essex and Suffolk coasts. The development was created in the early nineteenth century and closed down in 1988 when it was purchased by the London Docklands Development Corporation. Urban Space Management acquired the site in 1996 and redeveloped the site to become an urban centre for the arts. You can read more about the history on their website. Urban Sketchers London is teaming up with the Campaign for Drawing — the organisers of The Big Draw — for a sketchcrawl at Trinity Buoy Wharf in the East End on Sunday 16 November from 12noon to 4pm. It's free. Just bring your own drawing materials and be ready for whatever the weather has in store. It's a great venue for drawing a slice of docklands history and the location of London's last remaining lighthouse. We'll meet by The Electrician's Shop Gallery, Trinity Buoy Wharf, 64 Orchard Place, London, E14 0JY. There's information about the venue and the Draw Britain Now event at the Big Draw's event page and the Trinity Buoy Wharf website. You can find travel advice here. There are other drawing related events continuing at the gallery under the Recording Britain Now banner, organised by the Campaign for Drawing in collaboration with Trinity Buoy Wharf and the Guild of St George. The John Ruskin Prize exhibition of drawings, paintings, prints and textiles runs from 13 to 30 November.